Even though the low light capabilities of today’s cameras continue to improve, noisy images are still a common challenge among photographers. As much as we would love to capture photos with exposure settings that yield the cleanest possible image, many shooting situations call for us to make the choice between getting either a noisy photo or no photo at all. And until technology improves to the point that noise is a thing of the past, noise reduction is a skill that every photographer should be knowledgeable about. Before diving head first into reducing noise in our photos, it’s important to have an understanding of what noise is and what causes it. In digital photography, noise refers to random, irregular specks and grainy patterns in an image. With any digital signal also comes noise. On a radio station, for example, noise is the static accompanying an otherwise clear song coming through your speakers. With a good signal-to-noise ratio, the static on that radio station will be minimal or even imperceptible. With a poor signal-to-noise ratio, however, static takes over to the point that you can no longer enjoy, or even hear, the music through your speakers. In photography, noise shows up in an image as we increase our ISO setting, creating grainy textures which get in the way of the details in the image that we were hoping to capture (the signal). While increasing shutter speed or aperture physically allows more light to hit the camera sensor (by either extending the time the sensor is exposed to light or widening the opening in the lens that lets the light in), upping ISO boosts the sensor’s sensitivity to that light. Unfortunately, boosting the sensor’s sensitivity also boosts noise. In short, the higher the ISO setting on our camera, the more noise we may have in our image. There are three main types of noise that tend to pop up in digital photos. Luminance noise can be seen as contrast irregularities in photos. In lighter areas of an image, luminance noise shows up as darker “grain”, while in the shadows of an image, luminance noise shows up as lighter “grain”. Color noise shows up in photos as random, irregular color specks across the image. Both luminance noise and color noise are a result of high ISO values when shooting. The third type of noise, hot pixels, are a result of the camera sensor heating up, and are often a result of taking long exposures. Hot pixels are similar to color noise in that they show up as colored spots, but tend to appear larger and more spaced out than with color noise. The original file straight out of the camera. Ansel Adams famously said that nothing is worse than a sharp photo of a fuzzy concept. While noise is a real issue photographers have to deal with, no amount of noise reduction will make a lackluster photo into a great one. Further, there is no right answer as to how much noise is too much noise. A gritty, black and white street photo may look great with a bit of grain, while a family photo with the same amount of grain may suffer. I’m a perfectionist in my photography, so I will almost always notice noise before the viewers of my photos will. In the end, however, my rule of thumb is that if noise is the first thing a viewer notices, there’s either too much of it, or I just didn’t take a very compelling photo. With that said, the noise reduction methods below are excellent for combating noise in your photos. It’s important to note that no one method may be the best choice for each photo. While some methods do yield better results, they may also be more time-consuming, and, therefore, be way too much effort for a photo that will only be posted on Instagram and viewed on small cell phone screens. Consider each method to be a tool in your post-processing toolbox, and take advantage of them whenever the situation calls for it. To show the effects these noise reduction methods can have on your photography, we’ll try to save two photos, both of which suffer from high amounts of luminance and color noise. 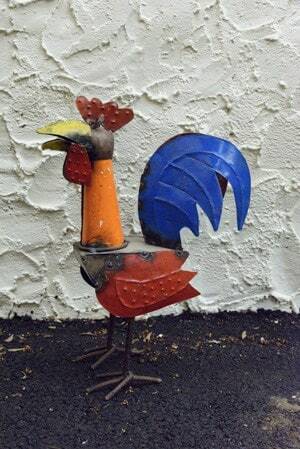 The rooster photo above, which I chose because it shows a great range of highlights, shadows, and colors, was shot with a Nikon D750 at a ridiculous setting of ISO 20,000, just to make it look extra awful. The Milky Way photo below was taken with a Nikon D750 at ISO 12,800 just out of actual necessity. Each of the photos need noise reduction, and slightly different methods work best for each. The Milky Way photo straight out of the camera. This one may seem like cheating, but the best way to reduce noise in your photos is to avoid it in the first place. And the best part is, this method works for every image across the board! As we went through above, noise is often caused by cranking up the ISO setting on our camera to try to compensate for low light and brighten the exposure. Since ISO is only one third of the exposure triangle, increasing shutter speed or widening aperture can negate the need to boost ISO. The same is true about adding artificial light. While lengthening shutter speeds or widening apertures won’t work for every scenario, trying to keep ISO values low should be the first defense against combating noise. Lengthening shutter speed is often a viable solution for brightening an exposure for landscape photographers who do much of their work on stable tripods. In situations where a quick shutter speed is necessary, however, widening aperture and/or choosing a faster lens may be a better solution. And if widening aperture leads to too narrow of a depth of field, artificial light is always a possibility. When all else fails, post-processing is here to save the day. The Detail panel in Adobe Lightroom’s Develop module is typically my first stop for any post-processing noise reduction needs. When loading a RAW file into Lightroom, the default setting for the program is to add a small about of color noise reduction to the RAW file by automatically adjusting the Color Noise slider to 25. While this does seem to mute the colors in the image slightly, this automatic adjustment has a huge effect on eliminating the color noise from the photo, essentially leaving us with only the luminance noise to deal with. Lightroom also offers two additional sliders to fine tune the Color Noise reduction: Detail and Smoothness. Neither of which have a terribly noticeable effect on the image, so I typically leave them at the default value of 50 and don’t spend too much time worrying about them. The original file (left) and the file after setting the Color Noise slider to 25 in Lightroom (right). The Luminance slider is Lightroom’s main defense against decreasing luminance noise in an image, and a little can go a long way. Similar to how the Color Noise slider takes away some of the “good” color in the image, the Luminance slider takes away detail (the signal) along with the noise, so choosing the right value is key. A small value on the Luminance slider such as 10 will have a noticeable but subtle effect on noise reduction, while a value of 100 will eliminate noise, but will also wipe clean just about all texture in the image. Just like with the Color Noise slider, Lightroom also offers two sliders called Detail and Contrast to ever so slightly tweak the effects of the Luminance slider. As with the sliders accompanying the Color Noise adjustment, I left both of these at the default of 50. The Contrast slider showed very little effect on the image, while the Detail slider caused an effect similar to that of boosting the Clarity slider, although very minimally. 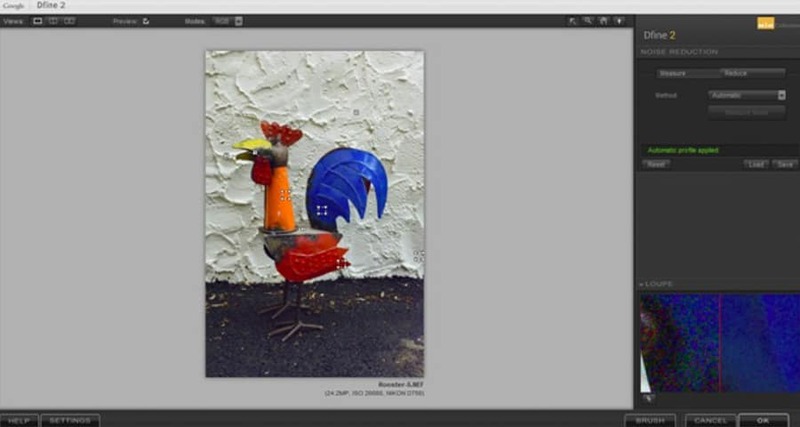 Overall, I found that around 40 was the best balance for the image between reducing noise and losing detail, and it produced quick and easy results when it came to bring the rooster image back to life. 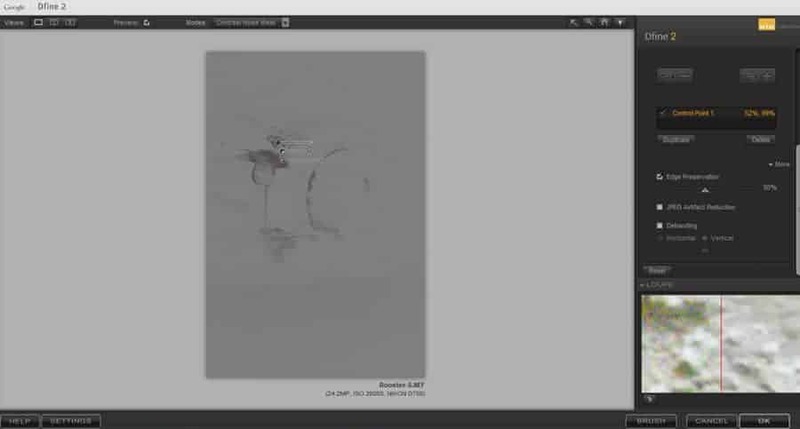 Another quick and effective technique for reducing noise with Lightroom is by playing with the Blacks slider in the Basic panel and the new Dehaze slider in the Effects panel. While these methods don’t work well in every type of photo, they do an excellent job making luminance noise less noticeable while also preserving detail in night photos. The Blacks slider in Lightroom affects the darker parts of the image only, essentially altering the far left portion of the histogram. The Blacks slider is often what I use in landscape photos to add an initial bit of contrast to the image by deepening the darker tones. Dehaze, on the other hand, is a new addition to Lightroom with the release of Lightroom CC, and was marketed first and foremost as a way to cut through fog and haze in images (and it does a great job). In addition to reducing haze, however, the Dehaze slider also serves another purpose by making noise in the darker tones of an image less noticeable. Just like the Blacks slider, it works very well with night photos. The image below shows a 100% crop of the original Milky Way image from above, as well as that same crop of the image with Lightroom noise reduction of +40 applied. As you can see, the noise reduction process reduces some of the luminance noise in the image, but it also blurs the lines between the stars and the sky around them, making them seem less crisp. 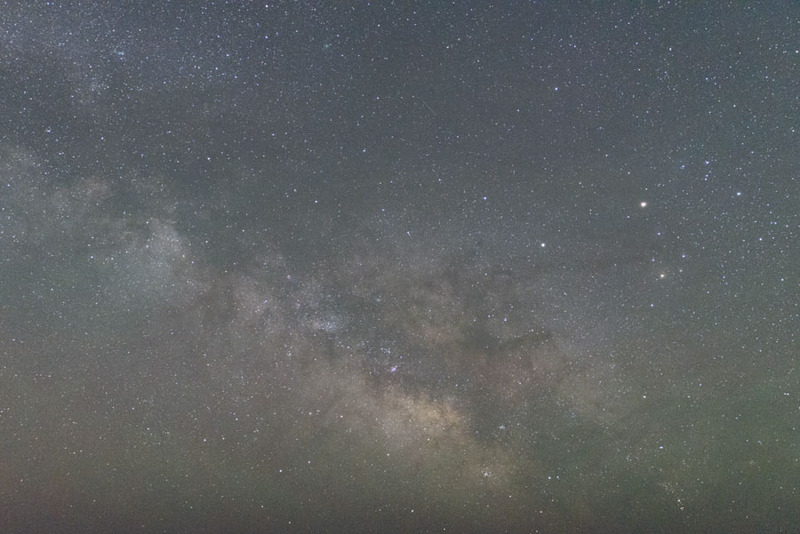 The original Milky Way photo (left), and with the Luminance slider in Lightroom set to 50 (right). Next, take a look at how dropping the Blacks slider to a value of -100 fares compared to using the Luminance slider. The Blacks slider affects only the sky around the stars, helping to darken the sky and make the luminance noise less noticeable, while also leaving the edges between the darks and lights crisp. In a night sky photo, this method also has the added benefit of darkening the sky in a way that makes it more similar to how we might view it in person on a moonless night. Original photo (left) and with the Blacks slider in Lightroom set to -100 (right). Similar to the using the Blacks slider, the Dehaze slider affects only the dark parts of the sky, leaving the stars crisp. However, to my eyes, the Dehaze slider increases the contrast of the photo as well, meaning that those lighter pixels of luminance noise are brightened slightly, making the overall noise reduction effect slightly less desirable than dropping the Blacks slider. However, because it leaves the stars with crisp edges, the Dehaze slider still holds an advantage over the Luminance slider because of the detail it preserves. Original photo (left) and with Dehaze slider in Lightroom set to +100 (right). There are plenty of third party noise reduction plug-ins out there that aim to take noise reduction to the next level. In the past I’ve tried full demos of Neat Image, Noise Ninja, Topaz DeNoise, Nik Dfine, and others, and settled on Nik Dfine for two reasons: 1) I found it to be the most intuitive and easiest to use, and 2) it’s now offered for free, which is my all-time favorite price. Nik Dfine 2.0 sampling the original rooster photo for noise and applying noise reduction. Nik Dfine can be used as both a standalone program and as a plug-in to Lightroom and Photoshop. It’s a powerful program that can be used as a simple, automated noise reduction software, or as a highly customizable experience where you can target areas for varying levels of noise reduction based on tones, luminosity, and colors. Dfine works by automatically analyzing an image upon opening it, and sampling several different areas to determine noise patterns. From there, Dfine applies an initial round of noise reduction, which can then be tweaked to your heart’s desire through options such as Control Points, which allow noise reduction to be increased or decreased by creating complex masks over portions of the image. The effects can then be applied in Photoshop as a layer and be further tweaked using brushes and selections. Mask applied by using a Control Point in Nik Dfine. For the rooster image, Dfine does a great job of ridding the image of color noise, handling the luminance noise, and preserving detail. In the “More” options tab in Dfine, I checked off Edge Preservation, which helped bring back detail even further. Before (left) and after (right) using Nik Dfine to reduce noise. While Lightroom and Nik Dfine try to wipe away noise with fancy computer algorithms, image stacking blows them away with a good old-fashioned boosting of signal instead. To go back to the radio metaphor, if Lightroom and Nik Dfine are trying to only get rid of the static interfering with the music you are trying to listen to, image stacking gets rid of static AND boosts the clarity of the music. When it comes to photography, I find image stacking to be the crown jewel of noise reduction. Although effective, image stacking is also time-consuming. In order to stack images, you need to have the foresight to take more than one shot of the same scene. Stacking images is also limited only to scenes with minimal movement, meaning that it may not be a viable option for action shots or fleeting moments that can't be recreated. I use image stacking most often in night photography by layering sky and foreground exposures to produce the cleanest possible image. 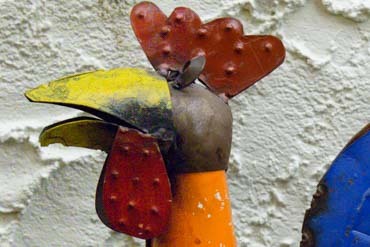 For the rooster photo, I took ten separate exposures with no noise reduction applied and loaded them into Photoshop as individual layers. Given that I was set up on a tripod when taking the shots, the images were already aligned. So, in order to begin the stacking process I selected all of the layers and clicked Layer>Smart Objects>Convert to Smart Object. Once the layers were finished converting to a Smart Object (which is an uncomfortably slow process on my badly-needs-to-be-upgraded laptop…), I selected the Smart Object and clicked Layer>Smart Objects>Stack Mode>Median, which effectively selected the parts of the scene which appear in the same place in each image (the “signal”), and got rid of the noise that appeared randomly across each exposure. 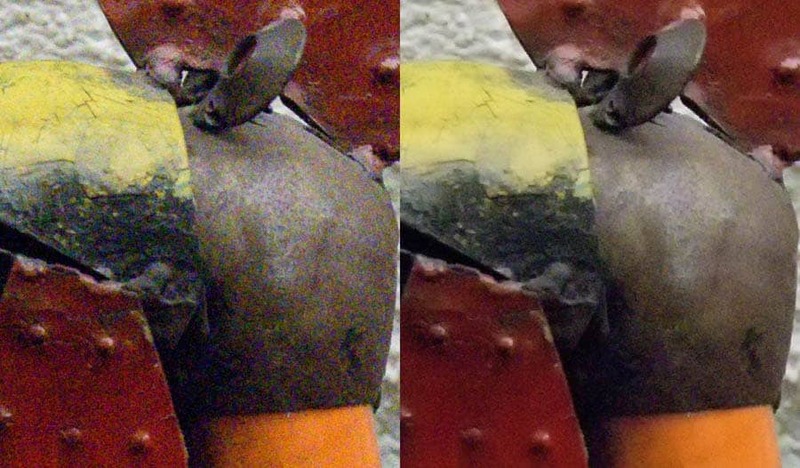 Original photo (left) and after using image stacking in Photoshop (right). The best way to reduce noise in an image will always be to just avoid it in the first place. Methods like adding artificial light, increasing shutter speed, or widening apertures to let more light through your lens are effective ways to brighten your exposure instead of increasing ISO. If these aren’t a possibility, however, your noise reduction toolbox should include any of the methods mentioned here. When choosing between your tools, try to ask yourself how you ultimately want the photo to be viewed. Instagram? Facebook? Portfolio website? Printed small? Printed large? If the photo will probably just be viewed on social media, Lightroom’s Detail panel is a great way for quick, easy, and effective noise reduction. If you have a night scene with noisy shadows, consider dropping the Blacks slider or using Dehaze to crush the noise and keep some extra detail. Keep in mind all of those functions can also be used as an adjustment brush for added control. If the photo is headed for print, Nik Dfine or image stacking may give the most control or best results to give you the cleanest print possible. Whatever method you choose, don’t forget to start out with trying to capture the best image you can. And most of all, good luck!